The quality of dining onboard is superb, and eating, or thinking about eating, quickly becomes a significant part of each day. You have an incredible range of choices on every menu, impressive for so small a ship, and passengers with dining restrictions will not lack for options. Quality ingredients like crab legs, caviar and organic salad greens appear regularly on the buffet or at happy hour. Unlike bigger ships, you don't get a choice of restaurants on SeaDream II. All meals are taken in either the indoor Dining Salon or outdoor Topside Restaurant, and the ship staff make that decision based on weather. However, you can ask to dine outside on nights when most people are dining in the Salon, and the crew will try to accommodate. Room service is also available, delivered to your cabin or to your lounge chair. Topside Restaurant (Decks 4, 5 and 6): The Topside Restaurant is less of a restaurant and more a smattering of tables located on the top three open-air decks. Padded wicker chairs and tables occupy a central covered area a few steps up from the small L-shaped buffet on Deck 5, but chairs and tables, including cozy padded banquettes, are also available in quiet nooks and corners by the rail, below on Deck 4 overlooking the pool and upstairs by the Top of the Yacht Bar. You will seldom wait for a table here at breakfast or lunch; just appear and seat yourself and within minutes a waiter and a bartender will appear by your side. At dinner, you will be asked whether you'd like to share a table or dine alone, and a crew member will show you to your table. Breakfast and lunch offer both buffet items and hot entrees ordered from a menu. When dinner takes place here, it is all menu-based and waiter-served. Breakfast is served from 8 to 10:30 a.m. There's a small buffet of cereals, fruits, yogurts, breads and pastries, deli meats and cheeses, and an a la carte menu of hot dishes (omelets, pancakes, oatmeal) prepared a la minute, with daily specials, such as eggs Benedict with smoked salmon and minute steak. The orange juice is freshly squeezed, and an extensive tea menu features both caffeinated and decaf loose-leaf varieties. Lattes and cappuccinos are always available, as are mimosas and Blood Marys. Lunch is served daily from 12:30 to 2 p.m. From the buffet, create your own salad with fresh and organic offerings (including shipmade tapenades and pepper spreads), prepared salads, cured meats like prosciutto and cold seafood (like shrimp, smoked fish and crab claws). A separate station offers a daily soup (often vegetarian) with garlic or focaccia bread. The lunch menu offers an impressive variety, from Asian-fusion or vegetarian Indian to pasta, fish and meat dishes. Hot dogs, hamburgers and veggie burgers are always available. It's all too easy on SeaDream to break your healthy holiday pledge to stay off alcohol, especially when a waiter appears in the lunchtime sunshine with a chilled bottle of white or rose he "just thought you might like to try." (Red is available, too.) Or, perhaps you'd prefer a cold beer or frozen cocktail? Dessert is always a selection of cookies (including vegan chocolate chip), several flavors of the ship's mouth-watering homemade ice cream and three to four desserts (a mousse and cake slices are often among the sweets), all found on the buffet. A variety of cheeses are also available for those who prefer a bit of Camembert instead of chocolate. When the weather is warm and dry, especially in Caribbean locales, dinner is often served up in the Topside Restaurant rather than in the Dining Salon. The menu is the same as it would be indoors (see below). Dining Salon (Deck 2): The elegant Dining Salon, with polished wood, crisp, white linen and fine tableware, has plenty of tables for two, but four- and six-top tables are available for dining with new friends. As with the Topside, it's all open seating; you can choose to share a table or eat just with your travel party. The Dining Salon is only open for dinner; we didn't have any rainy days, but it would, of course, have served breakfast and lunch if this had been the case. 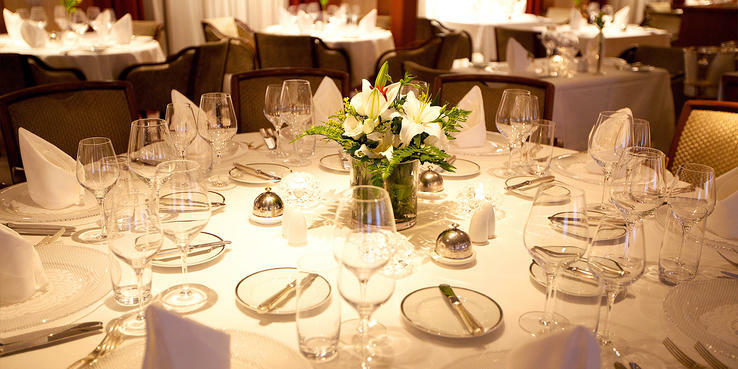 On warm-weather cruises, the Dining Salon is really only used on the first and last evenings, with dinner served at the Topside Restaurant as much as possible. Regardless of where you eat, the dinner menu is typically divided into four sections. It begins with the chef's recommended selections for the evening, a complete menu with two starters, a palate cleanser, main and dessert. It's followed by that day's changing roster of two first courses, two middle courses (typically a soup and a salad), three mains (including one vegetarian) and two desserts plus the daily ice cream flavor. Favorite dishes included escargot and beef carpaccio starters, pretty much every soup (like asparagus or mushroom), lamb and surf-n-turf entrees, and the chocolate-chili ice cream and Bailey's souffle for dessert. On the next page, you'll find the raw menu, again a complete dinner with one starter, one juice (usually a concoction of both vegetables and fruit), a main and a dessert. These dishes only use raw, organic and vegan ingredients (no fish, meat, eggs or dairy products) and are not heated above 118 degrees, so they retain all the healthy micro nutrients. The juices are quite tasty -- the Green Lemonade got rave reviews -- and the dishes we tried were less weird than we anticipated. For example, a veggie roll starter was simply vegetables wrapped in lettuce with a nice dipping sauce. The last menu section is the always-available offerings, including a basic salad, seafood minestrone soup, truffle tagliatelle pasta, maple-orange wasabi-glazed Atlantic salmon, chicken breast, New York-cut Kansas beef steak and New Zealand lamb lollipops. We found these to be rather tasty alternatives to the daily selections rather than the very plain meats and fishes usually found on cruise ship always-available menus. In fact, the tagliatelle was so good we ordered it twice. The portions are small enough to be manageable, though if you try to skip a course, you might find your waiter coming by with an appetizer or dessert he thinks you'd enjoy. Feel free to mix and match dishes from the various menu sections. Vegetarian and gluten-free items are marked on the daily menus, and sugar-free options are available upon request. For other dietary restrictions or food allergies, just alert SeaDream prior to your cruise and work with the dining staff onboard who make sure you're taken care of. House wines, a different red and white every night, flow generously. If you don't care for them, the sommelier will bring you another vintage, or fetch you a cocktail or soda. Tea, coffee and coffee drinks like cappuccinos are also readily available with dessert. Room Service: The room service menu is fairly robust, but we didn't really use it, having eaten more than enough at mealtimes. We did see people order "room service" from their sunbeds; apparently, hot dogs by the pool are a popular item after a morning tour or day at the beach. Breakfast is delivered until noon, and is limited to continental items like fruit, toast, bagels, croissants, pastries and juice. All-day options include a caprese salad with avocado, ravioli, flat-bread pizza, hot dog with coleslaw, cheese and crackers, and sandwiches (egg BLT, tuna wrap, PB&J and ham and Swiss panini). For something sweet, order the cheesecake or chocolate tart, or request some popcorn if you're watching a DVD in your cabin. Caviar, which used to be a room service item, now comes on its own caviar menu with a supplementary charge.